Season: summer, spring and autumn. 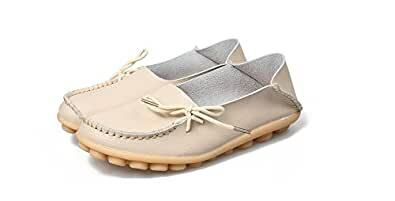 Breathable, non-slip flat-bottom peas shoes are easy to match with a variety of styles of clothing, we offer a variety of colors for your choice. Occasion: travel, hiking, walking, running, shopping, shopping picnics or any occasion you like. Comfortable flats. Note: The number of shoes is too small. It is recommended to choose the big one. loafers looks nice with jeans or skirts dress. Great gifts for your mother, lover and friends..
1.Casual Design: Casual style is great for all occasion. Can be worn as indoor or outdoor shoes, perfect for walking, shopping or traveling. 3.Non-slip Rubber Sole: Durable and flexible rubber sole for incresing walking traction and steady pace. Pillar-like outsole has Massage function while in walking, lightweight and comfortable to wear.